Larry “Wilky” Wilkerson, 72, of North Vernon, passed away at 2:23 a.m. on Thursday, April 11, 2019, at his residence. A funeral service will be conducted at 1:00 p.m. on Sunday, April 14, 2019, at Sawyer-Pickett Funeral & Cremation Service. Rev. Philip Elliott will officiate. Burial will be in Otter Creek Cemetery. Visitation will be from 4-8 p.m. on Saturday, April 13th at the funeral home. Born May 31, 1946, in Seymour, Larry was the son of William and Louise (Grant) Wilkerson. He married Margaret Castetter on July 30, 1983. She survives. He retired from Cummins, Inc. after 38 years of employment. He was a graduate of North Vernon High School and attended Tea Creek Baptist Church. He enjoyed golfing, camping, racing and IU Basketball. 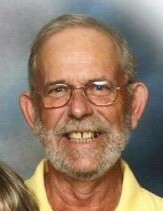 Larry is survived by his wife, Margaret Castetter Wilkerson of North Vernon; daughter, Molly (Chris) Hiser of Sellersburg; two sons, Jeff (Tammy) Wilson of Butlerville and Travis (Keri) Wilson Pohle of Alabama; nephew, Brian Wilkerson; eleven grandchildren and four great-grandchildren. He was preceded in death by his parents and a brother, Jerry Wilkerson.